"After [THE CONSPIRATORS play in] South America, we go straight to Europe and do the festivals over there. And then from Europe, we go back to the States and Canada and do our first Canadian tour, plus some U.S. dates. And that goes until August. And then after that, I'm gonna hook up with GUNS N' ROSES. GUNS N' ROSES has a small tour in October. And then… There's been so much talk about this [new] GUNS N' ROSESrecord, which we haven't actually done anything with. So we're gonna sort of focus on that. And then THE CONSPIRATORS will be [regrouping] some time coming up, depending on what GUNS N' ROSES is doing. But I've already started putting together material for the new CONSPIRATORS record”. ensational news! 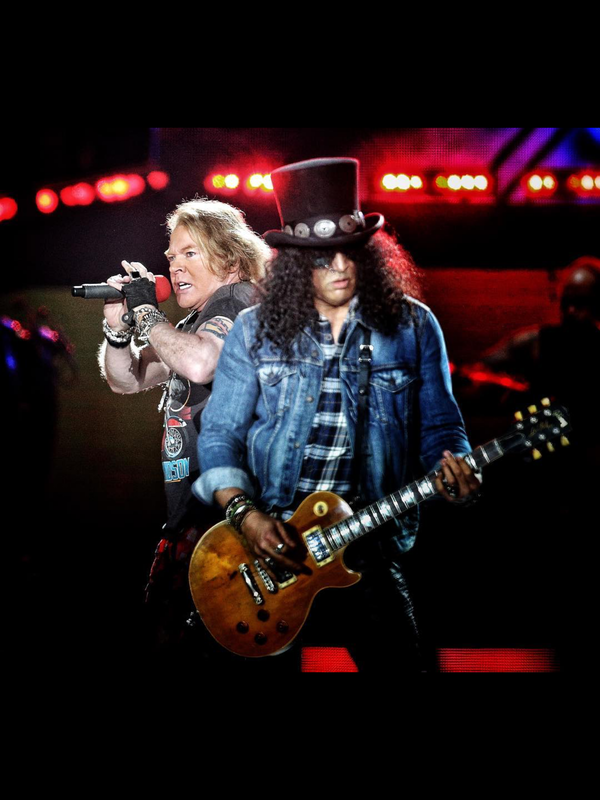 Can't wait for a new GNR mini-tour. But I've already started putting together material for the new CONSPIRATORS record”. It’s kind of Slash’s back up plan. He can’t around for GNR becsuse it might not happen, so he’s basically said Oct work on next GNR? Slash is just going to finish the record in 3 weeks them send it Axl for feedback. slash is playing with his toys while waiting for mommy to come home and put him to bed? It seems like he just likes to keep moving. But it sounds like he’s going to work on the new GNR album. In the same interview, Slash mentioned they have plenty of footage from the UYI tour. A quick look at retarded forums and I could see a bunch of lunatics drooling at the possibility of watching 30 years old footage of stupid millionaires who hate each other. Seriously, why would anyone be interested in seeing how Axl, Slash and Duff spent their days 30 years ago? And﻿ then… There's been so much talk about this﻿ [new] GUNS N' ROSESrecord, which we haven't actually done anything ﻿with﻿. Can't wait for the 24 Hour Buffet tour. It would be interesting to see if there's any fights or things like that. I mean Let it Be was a big film when it came out. As time passes by the more I realize GNR is not interesting. Never was. When they were on the top they were probably just like any other huge band except more stupid. The mysterious Chinese days are also uninteresting. A lot of hired musicians acting like they care or have a clue of what's going on, probably. Maybe it would be worth watching to check how Axl's hairline changes over the years. Those things could be interesting in 1995 or 2005. But not now. Too much time has passed. Just like the reunion. It's not interesting anymore. It's not relevant. They were not that talented or intelligent. The juicy controversy it might contain would now sound/look dated, especially knowing that these guys are all libtards cucks nowadays. But yeah, you and 50 years old soccer moms would certainly love it. I'd take some decent 90's footage over anything from the session musicians. Has to pay Perla somehow. You would think he could have had a better lawyer. Especially since he was screwed by Axl's legal team twenty years before. I'd watch a clip or two on YT if some HD clip is ever uploaded. Read the details of his divorce. Perla hardly took him to the bank.